Heel pain is most often caused by plantar fasciitis, a condition that is sometimes also called heel spur syndrome when a spur is present. Heel pain may also be due to other causes, such as a stress fracture, tendonitis, arthritis, nerve irritation or, rarely, a cyst. Because there are several potential causes, it is important to have heel pain properly diagnosed. A foot and ankle surgeon is able to distinguish between all the possibilities and to determine the underlying source of your heel pain. Wearing nonsupportive footwear on hard, flat surfaces puts abnormal strain on the plantar fascia and can also lead to plantar fasciitis. This is particularly evident when one’s job requires long hours on the feet. Obesity and overuse may also contribute to plantar fasciitis. People with plantar fasciitis often describe the pain as worse when they get up in the morning or after they have been sitting for long periods of time. After a few minutes of walking, the pain decreases because walking stretches the fascia. For some people, the pain subsides but returns after spending long periods of time on their feet. To arrive at a diagnosis, the foot and ankle surgeon will obtain your medical history and examine your foot. Throughout this process, the surgeon rules out all possible causes for your heel pain other than plantar fasciitis. 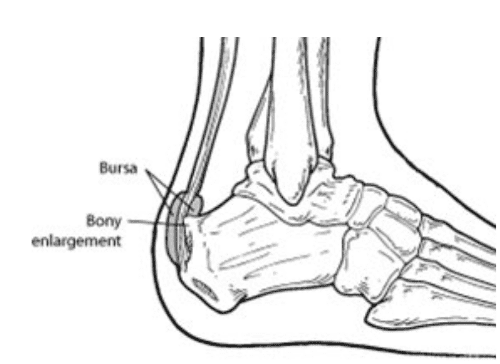 In addition, diagnostic imaging studies, such as x-rays or other imaging modalities, may be used to distinguish the different types of heel pain. Sometimes heel spurs are found in patients with plantar fasciitis, but these are rarely a source of pain. 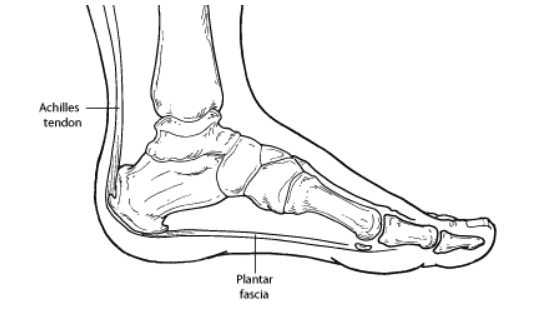 When they are present, the condition may be diagnosed as plantar fasciitis/heel spur syndrome. Padding, taping and strapping. Placing pads in the shoe softens the impact of walking. Taping and strapping help support the foot and reduce strain on the fascia. Haglund’s deformity is often called “pump bump” because the rigid backs of pump-style shoes can create pressure that aggravates the enlargement when walking. In fact, any shoes with a rigid back, such as ice skates, men’s dress shoes or women’s pumps, can cause this irritation. Medication. Oral nonsteroidal anti-inflammatory drugs (NSAIDs), such as ibuprofen, may be recommended to reduce the pain and inflammation. Ice. To reduce swelling, apply an ice pack to the inflamed area, placing a thin towel between the ice and the skin. Use ice for 20 minutes and then wait at least 40 minutes before icing again. If nonsurgical treatment fails to provide adequate pain relief, surgery may be needed. The foot and ankle surgeon will determine the procedure that is best suited to your case. It is important to follow the surgeon’s instructions for postsurgical care.